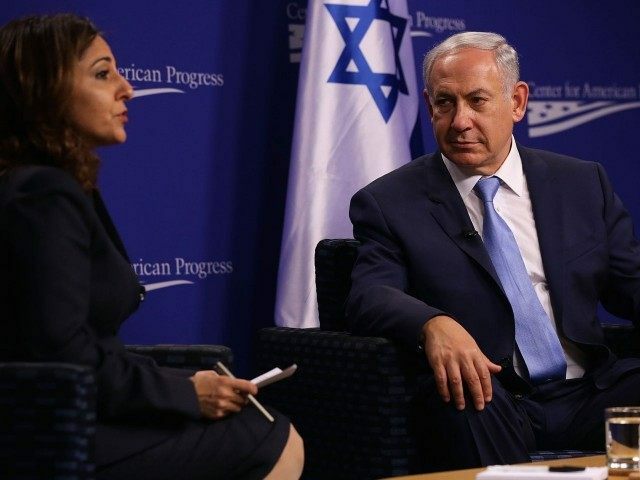 Israeli Prime Minister Benjamin Netanyahu charmed the left-wing Center for American Progress (CAP) in an unusual talk on Tuesday that some on the left had protested vehemently. “I’d like to talk to a progressive audience about progressive values,” Netanyahu said, and he did–even as he confronted tough questions about Israeli settlements, the future of the peace process, and his controversial statements about Arabs as Israelis voted earlier this year. CAP, founded by former Clinton administration White House chief of staff John Podesta, has become the core of the left intelligentsia in Washington, D.C. Many of its staff have gone on to work in various Obama administration posts. A few years ago, CAP bloggers drew accusations of antisemitism for their use of the term “Israel firster” to describe pro-Israel advocates, and for inflammatory rhetoric comparing Israel to the Jim Crow-era South. On this occasion, Netanyahu began on the defensive, as CAP president Neera Tanden quizzed the Israeli leader on his record and whether he could deliver peace. Regarding his warning that foreign NGOs were busing Arab voters to the polls, Netanyahu offered an immediate admission. “The statement, as it was said, was wrong. First of all, Arabs voted for me,” he said. He detailed his post-election apologies and work to assist Arab communities in Israel. Netanyahu also pushed back, gently, against the notion that Israeli settlements were the obstacle to the peace process, noting that the problem remained the Palestinian leadership’s refusal to accept the existence of a Jewish state in the Middle East. More broadly, he said, the conflict in the region was between “modernity and early medievalism,” not between the Israelis and Palestinians, though he was certain radical Islam would lose. “Militant Islam will go down…I don’t think it can compete with the desire for freedom, or the technology of freedom,” he said. Questions from the floor included a query from Morton Halperin, the board chair of J Street, a far-left organization that often opposes Israel in Congress. Halperin asked Bibi to define the borders of a future Israeli-Palestinian peace. Netanyahu demurred, saying he had learned from past Israeli failures not to state his negotiating position up front. Eventually, the questions turned towards more benign topics such as trade. At that stage, it was clear that Netanyahu had won over his audience–or, at the very least, blunted the opposition of his worst critics. For all the recent controversy over his rhetoric about the Palestinians and the Holocaust, or about the controversial opinions of his new media adviser, Netanyahu’s pitch to “progressives” caps what has turned out to be a successful U.S. visit.